Asbestos has been known to man and used for centuries in thousands of applications and products. As a result of these unique chemical and physical properties asbestos became a useful ingredient in a numerous commercial and industrial products. The first asbestos mine opened in Quebec Canada in 1879. In the early 1900s, asbestos was woven into textile and produced into insulation blankets, gaskets and packing material. By the mid 1940s and over the next thirty five years, the asbestos industry diversified to include mechanical pipe insulations, cement products, plasters, gypsum board filling compounds, grouts, compressed papers, mill boards, floor tiles, sheet floorings, acoustic tiles, roofing felts, mastics, duct tapes and sealants, protective coatings, fireproofing, and numerous other products. By 1966, Canada was producing 40 percent of the world’s chrysotile asbestos. By the 1970s, doctors had declared the asbestos mining towns in Canada to be among the most dangerous in the world, with rates of mesothelioma and other asbestos diseases shockingly high and increasing. In 1979, the Government of Canada adopted a controlled-use approach to asbestos and the carcinogen was banned The manufacture of most asbestos containing materials was banned in Canada in 1979, but many non friable materials continued to be produced, stockpiles still exist and asbestos products can be found in buildings built into the early 1990s. At least 4,000 household products used by Canadians during much of the 20th century contained asbestos in varying amounts. Asbestos fibres can divide both horizontally and longitudinally many times and ultimately end up as microscopic fibrils that are invisible to the naked eye. These microscopic fibers are extremely aerodynamic and can remain airborne for extended periods of time, hours or even days. Serious respiratory diseases such as asbestosis, lung cancer, and mesothelioma have been associated with inhalation of asbestos fibres. A latency period of between 10 and 25 years is common between initial exposure and recognizable symptoms of asbestos related disease. 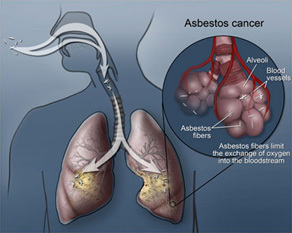 There are three main diseases associated with the inhalation of asbestos fibres Asbestosis, Lung Cancer and Mesothelioma. Flooring Systems: paper backed sheet vinyl flooring, sheet flooring, vinyl tile, linoleum, and leveling compound and mastic. Walls & Ceilings: drywall joint compound or mud, stippled and smooth plaster, spray applied texture coat (popcorn ceilings), cementitious wall-board, acoustic ceiling tiles, and acoustic spray applications. Mechanical/Electrical: pipe and tank insulation, insulating cement, duct tape and sealant, gasket and packing material, fire-stop grout, paper insulation within incandescent light fixtures, electrical wire insulation, and heat shields. Roofing Systems: shingles, roofing felt, and asphaltic mastic. Fireproofing spray applied fireproofing, trowel applied fireproofing, and pre-manufactured fireproofing products. Miscellaneous: woven textiles, drain pipes, underground piping, adhesives, caulking, sealants, window putty, mortars, grouts, exterior siding, automotive brake pads and clutch facings.